Recover & Export Corrupted SQLite Database in Other Database Formats. Recovers .db files created by MS-Outlook 2013, Thunderbird, etc. The software provides a platform for performing recovery of corrupted SQLite database. You can recover tables, views, triggers, etc. from the SQLite database file. Further, you will get a preview of all the data items that are recovered with the utility. Once you select the SQLite database file, the application will execute a quick scan of all the items present in database and provide a view of the SQLite database components. You can make use of the preview option for selective export of files. When you are exporting the recovered SQLite database to any of three file formats, you are provided with the option to select the items that you wish to export and leaving behind those that are not required. This is done by enabling the checkboxes present against the data items. On choosing the Domain Source Name for exporting the recovered data, the utility will urge you to map data of SQLite database with the data types of other database. However, the software will execute a default mapping of all the data items but you have the flexibility of mapping the data with the help of SQLite recovery software. Can I recover the corrupted SQLite.db file created by a UNIX application? yes, SQLite recovery software repair the corrupted SQLite database that is created by any application. It supports recovery of SQLite.db file created by applications on Linux, Mac, Windows, or Android Operating System. Is SQLite data recovery software capable of recovering deleted columns of a table? Yes, you can use this software to recover deleted columns, triggers, tables, views, etc. Do I need have the SQL server set up on my system to save the recovered database in MDF file format? No, you do not need to have SQL server environment for exporting recovered data in MDF format. You can recover the MDF files through a Domain source Name. Is this tool compatible to be run on Mac installed systems? 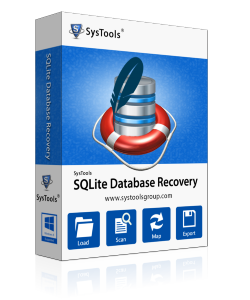 The SQLite db recovery software has been designed specifically to suit the requirements on Windows platform. Therefore, you cannot use this tool on MAC or any other operating system. For extracting important documents, the product has been very helpful. It allowed me to access the SQLite database file conveniently. SQLite data recovery is a tool for which I have been looking for long and I am happy after getting it." Forensics related investigations cannot be completed without the recovery of SQLite files that are corrupted. In such a scenario, I found your SQLite db recovery tool to be useful. Thanks for coming up such a product that allowed me to retrieve the SQLite database."